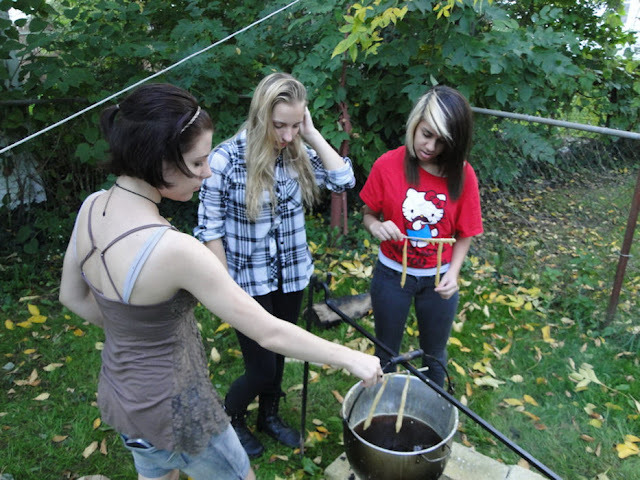 Passion for the Past: The Past Meets the Present: My Daughter's Candle-Dipping Party! The Past Meets the Present: My Daughter's Candle-Dipping Party! candles on the candle wheel. That's my 15 year old daughter on the right. 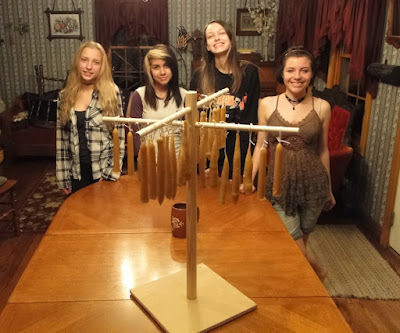 My daughter - my very contemporary 15 year old daughter, who has very contemporary friends - had a candle-dipping party. 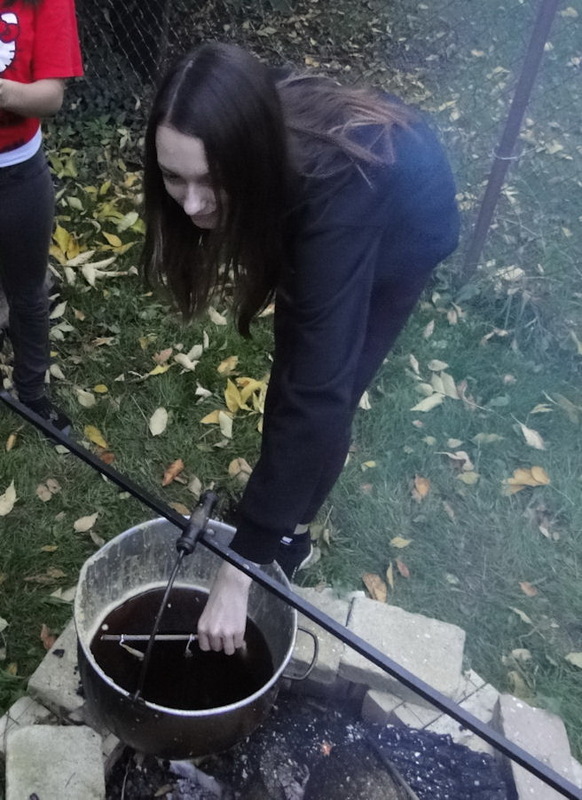 Yes, you heard me correctly: teenagers from 2016 made candles in the traditional way on a Friday evening...and had a blast doing so! 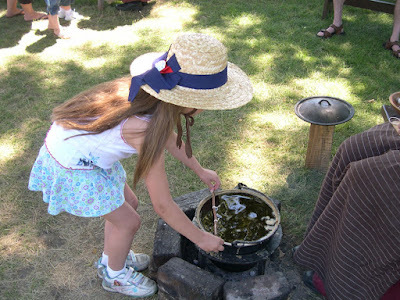 Even though my daughter is a reenactor, and has been one nearly her entire life, she is a typical modern teenager of today: her choice in music, clothing & hair styles, activities (outside of reenacting) show all of this. And I'm okay with that. This is her time, and even though we have a room in our house that replicates a parlor from the 19th century, we, too, are modern people. We pretty much have to be, to an extent. Anyhow, as many of you know, the Civil War group I belong to - the 21st Michigan - presents a sort of Harvest Home presentation at one of our most favorite events, Wolcott Mill, which this year takes place October 15 & 16. This is where our civilian membership displays and presents the numerous chores and activities that occur during this time of the year. Walking through our camps the visitor will see lots of fall-flavor cooking, drying of fruits & vegetables, basket making, corn husk dolls, wool dyeing and spinning, quilting, crocheting and knitting, and just generally celebrating the fall harvest. I, as an 1860s farmer, will have, at my tent, a scythe, sickle, flail, a press to make cider, and heirloom apples to display. Sometimes there will be that oh-so-important chore of candle-making. In previous years I did the candle-making process for the public to witness, but this year I plan to concentrate more on my heirloom apples and farm presentation, for candle-making can be time consuming. So this now brings me right back to my daughter and her friends. 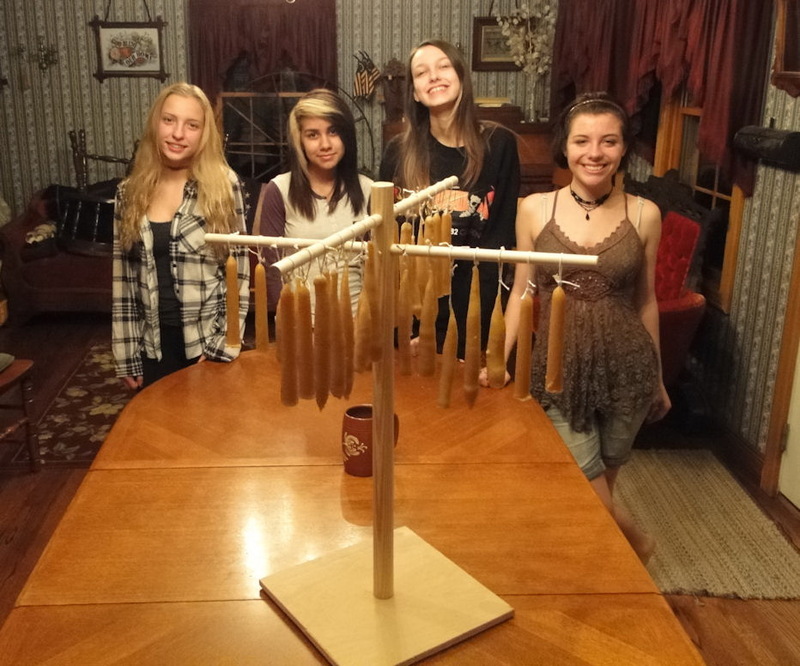 While driving to school a few weeks back I mentioned to her about us making a bunch of candles at home to bring to Wolcott as a display rather than as an activity, and what did she think about maybe having a few of her friends over to help us do it; for "many hands make light work." She loved the idea...and so did her friends. at the 1760 Daggett Saltbox Farm House. She began living history early in her life. 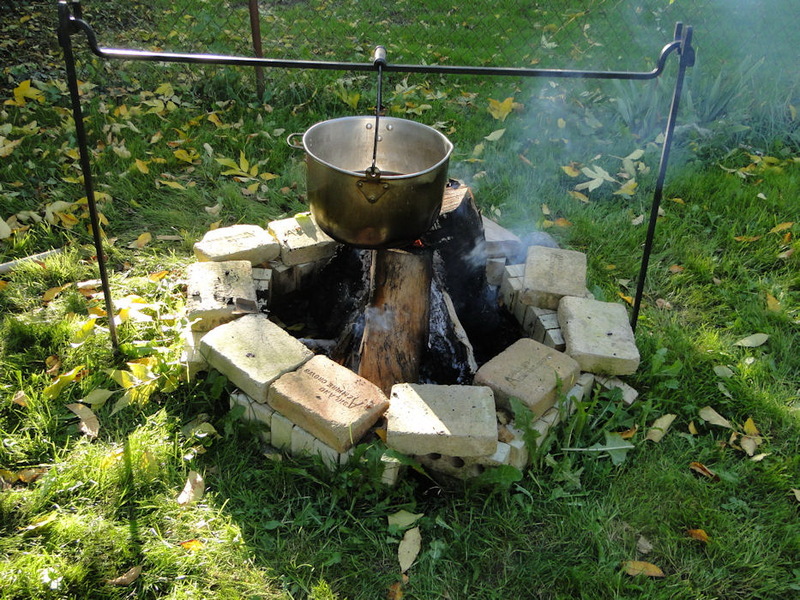 I promptly ordered about six pounds of beeswax (from Ebay - sorry, I'm actually really not a 19th century farmer), which arrived pretty quick, and that was good because the candles had to be ready by mid-October. Come Friday, I brought her friends over from school - they all go to the same high school - and got everything prepped to go. My daughter, who has been hand-dipping candles since she was probably three or four years old, gave a tutorial to the other girls, and I don't believe she forgot a single thing. In fact, she's right up there with the best of the dippers! Anyhow, her friends followed her directions and, well, the following photographs are a recording of the events of that night. The set up in our yard consisted of a few pieces from our reenacting cooking apparatus over our backyard fire pit. The beeswax looked pretty cool as it was melting in the pot. Unfortunately, I was pretty busy taking care of other things and forgot to take a picture, so you get to see the melted wax with a reflection of a tree instead. There was nothing extra added - no scents to make the candles smell "nice"---not even the traditional natural scents. Just plain, pure beeswax. Another of my daughter's friends showed up a little later. Each girl kept pretty busy doing each step to create the candles. 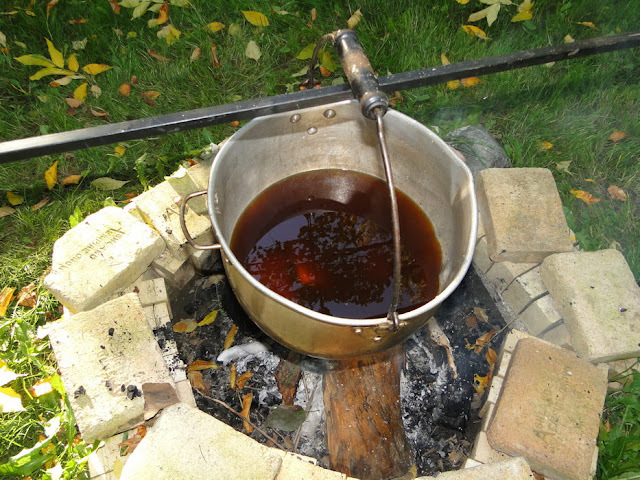 We included a large pot of cold water to cool the candles quickly after each dip in preparation for the next, just like at the Daggett House. 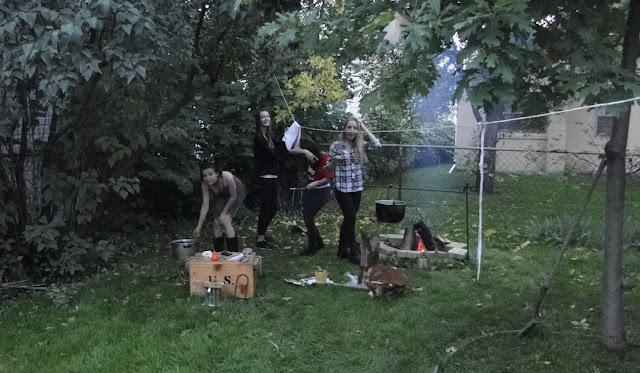 They continued dipping candles well into the evening darkness as the cool autumn air descended after an unusually warm day. Here are the 28 candles made this day - 20 hand-dipped and eight made by me with my tin candle mold. 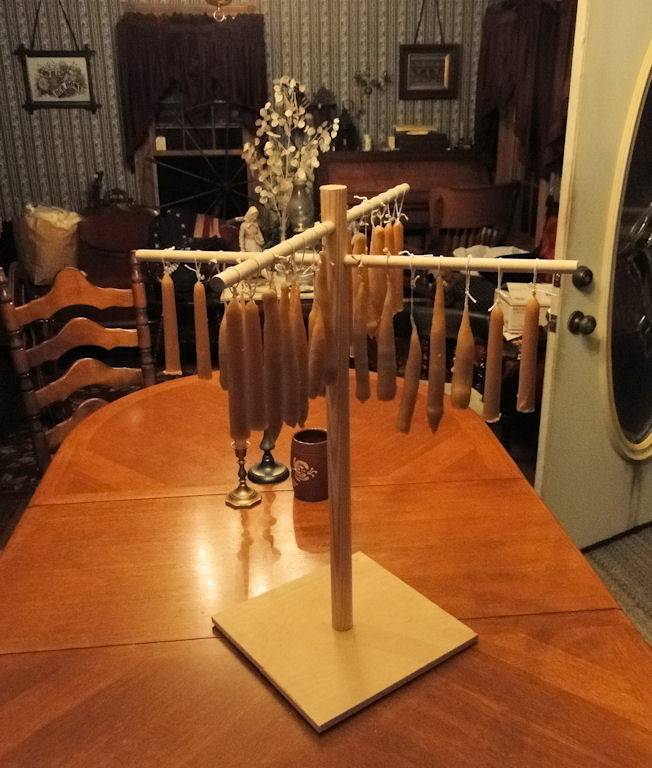 I *mostly* made the wooden candle wheel dryer that you see here as well. 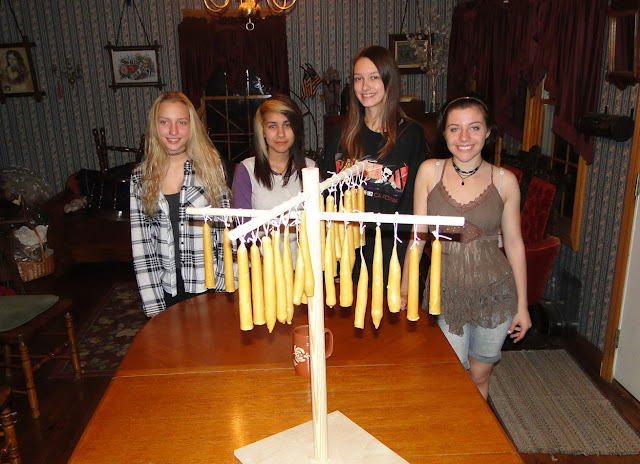 I was happy when my daughter agreed to ask her friends to see if they were up to candle-dipping. I was elated when they said, "Yes!" To have an age-old tradition carried on by young ones who had no idea - and have a lot of fun while doing it - is pretty darn awesome, don't you think? And now I have plenty of candles to show the visiting public when they come to Wolcott Mill (and even a little wax left for demonstration purposes, should the need arise)!